Good performance. Very happy with the goggles. These goggles are great. reasonable price and good performance. I have linked them with several camera types. I wish they had a video out option but I am very pleased with their performance. I did modify them to be free standing due to my need for reading glasses so it is like watching a little TV. The set up was extremely easy. I was able to turn it on and hit scan and it picked up my transmitter. Great Picture and easy to set up. What more could you ask for. 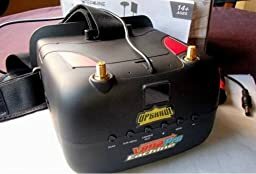 This is FPV Goggles is amazing !! 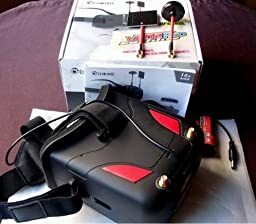 Comment:The FPV quality is very good, and the picture is clear, the signal is smooth, no "jelly", FPV feeling is very unique, it looks like I'm on my plane, the design of the glasses is very good, it can prevent eye fatigue, and there are a lot of padding, very comfortable, not too much weight. I think this google is an awesome deal from the cost – benefit point of view. For around US$ 119 you get a 800x480 screen, diversity, DVR and battery + charger. It is small enough to carry on your bag, it is lightweight and the battery offers a good duration.